Remember the little stitching projects I was setting up several weeks ago, in order to have some relaxing, mindless handwork to do? First, I shared this snowflake corner pattern with you, and chatted about doing cross stitch on plain weave fabric. And then we talked more in-depth about cross stitching on plain weave fabric, and I suggested this option for working a gridded pattern. And then, for the fun of it, I posted this second snowflake pattern for you to stitch, too. Today, I want to add to your collection a little bit, with a folky combination of leaping deer and a tree, replete with snowflakes and a lacy border. The design works great on the front edge of a cloth napkin or a foldable guest towel or kitchen towel, or – better yet – on the short end of a table runner for your holiday table! 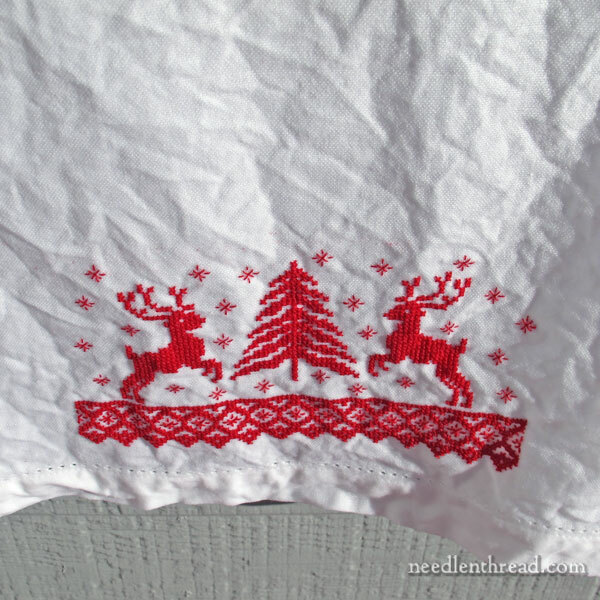 If you want, you can even extend the border part of the design, or repeat the deer and tree motif along a longer edge of a table cloth or other household linen. There are lots of possibilities! …this pathetic photo is the last one I took of this particular piece. It was hanging on a skirt hanger from my mailbox, outside, soaking wet after rinsing the water-soluble grid away. It’s in the Ironing Stack as we speak. You know the Ironing Stack? It’s the stack I avoid, until avoidance is no longer an option. Strangely enough, I love ironing – or at least, I love the effect of ironing. I just don’t love “getting around” to ironing. In any case, it’s a fun and easy pattern to stitch, and I hope you can find some use for it! If you want to work it on regular plain-weave fabric (not even-weave), it fits on DMC water soluble canvas, or you can print a grid on Sticky Fabri-Sovly, and go that route. Either way works! When it comes down to it, I prefer the feel and ease of working on the DMC water soluble canvas, as opposed to the sticky Solvy, but both work. Here’s the handy-dandy PDF printable. Important: Before you hit print, go to your printer settings and choose “shrink to fit” or “shrink oversized pages” or something along those lines. Otherwise, if you try to print at 100%, the chart won’t fit on one page. Even if counted work isn’t your thing, maybe you have a friend who would enjoy doing it. Feel free to send them the link to today’s article! If you’re looking for more hand embroidery patterns – especially patterns for surface embroidery – you’ll find plenty of them here on Needle ‘n Thread. And 3. Completely off-topic, but I wonder if you’re aware of Dr. Batchelor’s (she’s at the U of Kent) project focusing on 18th-century embroidery patterns from “Ladies Magazine?” If you have time to take a look at the Two Nerdy History Girls blog, they have a link to the patterns available so far and information about the project. I may or may not have suggested that Dr. Batchelor contact you…. Hi, Liz – Yes, I saw that post on TNHG in my feedreader, just a little bit ago! It looks like a fascinating project. The deer is definitely a knit-friendly thing. It was inspired by an old sweater I had when I was in school. I had a photo of me in it, and I said… ah! those deer would make a good cross stitch pattern. I couldn’t zoom in close enough on the photo, to see the exact details – you know, it was pre-digital-camera-age, hard to believe, but they are certainly reminiscent of knitted sweaters. I know what you mean about avoiding ironing not my favourite household task. 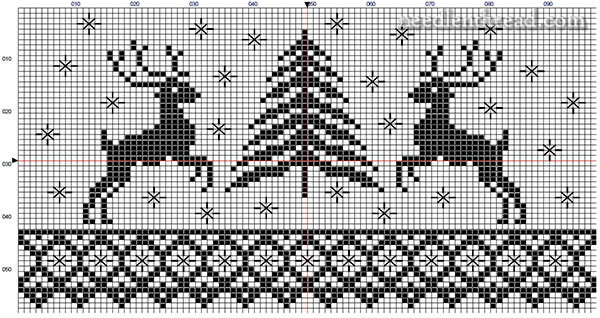 The deer and the christmas tree is a really pretty pattern, I like the leaping deer and the snowflakes a lovely pattern for the Christmas season and would make a lovely present. Thanks for sharing the pattern and for the links to other Christmas patterns which are also nice. I hope you have a great weekend and are feeling better. Thanks, Anita! I’m glad you like the patterns! Not to derail the conversation away from stitching, but from experience, Mary, I can tell you that the treatments will throw you for another loop. It’s imperative that you rest and not push yourself too much. I’ve decided that you will come through this strong and healthy, therefore, you will. 😉 Chemo is no fun at all, but it also isn’t forever, and it’s okay to hate it more often than not. Thinking of you and Praying for you at this difficult uncertain times, I do hope you can get some embroidery done this weekend and take lots of rest. OMG, you’re not perfect! Phew, I can continue surfing the web in my jammies even though it is past 10 am. The ironing can definitely wait. Thanks, dear, for the deer but counted cross stitch makes me cross. Maybe a frog would tempt me more? Thank you Mary! It is so kind of you to think of us when you have bigger and more difficult things on your plate. This is a perfect, cheery design and I know I will have fun stitching it and thinking of you. You know all those little dust motes we see in the air? Those are the thoughts and prayers for you from your cyber-friends! Dear Mary, lovely pattern, it will translate to filet crocheted lace, too. I can make some lace using just the border you have, and use it on purificators. I get bored with simple tatted lace. As an aside, years ago when I had an ailment just like yours, I would keep small handwork nearby and I got A LOT done. Some good days, some bad days, but the variety helped keep me busy and preoccupied. Praying for you, and never underestimate the power of a good rest! Dear Mary, thank you for the wonderful cross stitch pattern today. I can see it repeated as a scarf along a mantle piece, kitchen dresser or the top of a piano. The tree could be stitched for a Christmas card. Very versatile. You’ve done a lovely piece of embroidery for Christmas and, once again, inspired us. I love the effect of ironing too and cannot resist starching and ironing my pillow cases as well as my embroidery. It helps if you can leave your ironing board up and your iron at the ready in an out of the way spot. Ironing is definitely undervalued by todays youth! Thanks for the deer and tree pattern. I am always looking for patterns for our annual Christmas ornament exchange and this should come in handy for next year. Hope you are feeling better and getting some rest. Good luck with your treatments next week. We are all thinking of you and wishing you well…..
Hard to resist telling you that waiting for a Muni bus yesterday here in San Francisco, I saw an entire bus covered with more design inspiration in advertising iconic cobalt blue SKYY vodka bottles like blue and white Fair Isle knit sweaters in their Let’s Holidayy campaign (the doubled Y is intentional, like their brand). In New York, a knitting needle armed crew, will create large-scale pieces inspired by the limited edition bottle live at Chelsea Market, which will remain on display for the month. Thank you for the pattern, and I’m glad you’re recovering from the surgery. Just referred to your video on the coral stitch for a project on which I am working. Thanks so much for all of them. Praying for you and wishing you a speedy and full recovery. Mary, I hope you are doing well and the Dr.s are getting you all fixed up! Thanks as always for a lovely pattern, you always seem to find the perfect ones for us! I will have to put it the list for next year though – like everyone there’s too much to do at this point in the year… Thinking of you and sending good wishes for next week. Previous Previous post: When You Care Enough – Embroider Your Cards!